Spackle and caulk are two soft, semi-liquid materials that are used to fill cracks or holes in various types of surfaces. Although at first glance, they may seem interchangeable for a number of home improvement jobs, they are not. Both substances emerge from an applicator or tube in a soft state, then harden after prolonged exposure to air. Their applications, however, are very different. 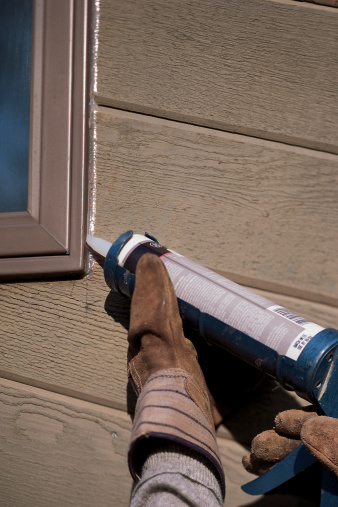 Caulking is often applied around windows to seal out air and moisture. At its most simple, spackle is used for repairing larger holes in a wall. It is also commonly used to help smooth out imperfections in walls so that a surface that needs to be painted or covered with wallpaper or another substance is level. Spackling is used on drywall and plaster. For large holes within wooden surfaces, wood putty is used to fill, set and smooth an area. Spackle is used for holes that are the width of a quarter or smaller. For larger holes, drywall compound should be used for the repair. To properly apply spackle, use two patching knives: a smaller one to scoop out the substance from its container, the second to tap it into place. Patching knives of 3 or 6 inches are usually sufficient, although for tight areas, a 1-inch knife may be needed. Likewise, for larger jobs such as spackling drywall seams, a 12-inch knife should be used. A good rule is to use a knife larger than the hole to be filled. Spackle should be applied in layers because the substance tends to shrink. Sometimes as many as three layers are needed. Drying time takes about an hour. When spackle is dry, it should be sanded so the surface is level with that of the surrounding wall. Caulking may be considered the final step in readying surfaces for painting or other types of work. Whereas spackle is used to repair, caulk is a sealant, filling nooks and crannies where air may infiltrate or escape, such as around windows and baseboards, as well as to achieve a finished look in areas such as bathrooms. It also helps keep humidity out of areas where it is applied. Places where caulk is used include bathtubs and plumbing fixtures, around tile, window and door frames, baseboard, flashing, moldings, gutters and downspouts, concrete and mortar and around foundations. Before application, ensure that the area to be caulked is free of dirt and clear of any old caulk. Apply the material in a gap with a smooth forward motion in a single sweep of about 3 feet at one time. The material may be pushed into the gap by a caulk smoother or via a Popsicle stick or moistened finger. Aim the caulking gun at a 45-degree angle, ensuring that the material touches both surfaces. As different types of caulk such as acrylic and silicone are available, verify that the type you purchase is appropriate for your application. Can You Put Spackle in Concrete Wall Holes?